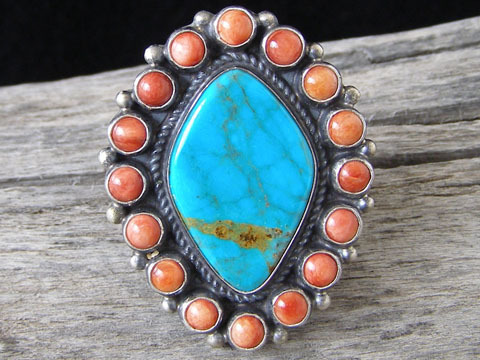 This over-sized cluster ring has a large free-form stone of stabilized Kingman turquoise at its center surrounded by sixteen rounds of red spiny oyster. The shank of the ring is formed by four lengths of round wire, fused on the sides and in back to form a solid band. Nicely "antiqued" to give this a patina and old-style flavor. Note the dimensions cited below; this is a large, showpiece ring. Kingman turquoise: 1 3/16" x 3/4"
Dimensions of ring face: 1 7/8" x 1 1/2"